Gwendolynne Moore is a Democratic member of the United States House of Representatives, representing the 4th district of Wisconsin. Congresswoman Moore is a member of the prestigious House Committee on Financial Services, which has jurisdiction over the banking, insurance and housing industries. She serves on two subcommittees of the House Committee on Financial Services, including the Subcommittee on Capital Markets and Government Sponsored Enterprises and the International Monetary Policy and Trade Subcommittee. Rep. Moore also sits on the House Budget Committee, which oversees the federal budget process, reviews all bills and resolutions on the budget, and monitors agencies and programs funded from the budget process. She is also a member of the Democratic Steering and Policy Committee. Born in Racine, Wisconsin in 1951, Congresswoman Moore was raised in Milwaukee. The eighth of nine children, Rep. Moore’s father was a factory worker and her mother was a public school teacher. Congresswoman Moore attended North Division High School in Milwaukee where she served as Student Council President. After graduation, Rep. Moore started college at Milwaukee’s Marquette University as a single, expectant mother on welfare who could only complete her education with the help of TRIO. Congresswoman Moore earned a B.A. in Political Science from Marquette, and went on to serve as a community leader, spearheading the start-up of a community credit union as a VISTA volunteer for which she earned the national “VISTA Volunteer of the Decade” award from 1976-1986. Gwen Moore served in the Wisconsin State Senate from 1993-2004. Prior to her election to the Senate, Congresswoman Moore served two consecutive terms in the Wisconsin State Assembly from 1989-92. In 2000, Congresswoman Moore earned a Harvard University Certificate for Senior Executives in State and Local Government. As a state legislator, Congresswoman Moore was a champion of progressive and social issues and has continued to stand up as a voice for each and every constituent and neighborhood across the city. She applied her career expertise to help create jobs and build communities. She made a positive impact in critical issues related to welfare, education and criminal justice. A tireless advocate of women's rights and civil rights, Congresswoman Moore led the fight against racial profiling, domestic abuse and voting rights violations. 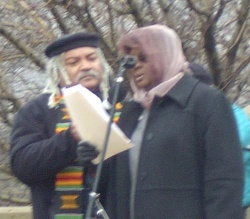 At the close of 2006, Milwaukee radical activist George Paz Martin was given a Lifetime Peacemaker Award by the Wisconsin Network for Peace and Justice, and was honored on December 6th in the U.S. House of Representatives in a statement read by Gwen Moore, Representative to Congress from the 4th Congressional district. Martin has appeared on every major U.S. television network, C-Span, CNN, BBC and Democracy Now to speak against the War in Iraq, as well as countless radio and television stations around the world. Gwen Moore signed the letter. As of February 20 2009 Gwen Moore was listed as a member of the Congressional Progressive Caucus. At 1 p.m. on Saturday, March 21, a small crowd of roughly 300 protestors had gathered outside the county courthouse at 10th and Wells in Milwaukee, Wisconsin. Congresswoman Gwen Moore spoke to the assembled. On Jan. 27, 2010, U.S. Representatives Keith Ellison and Jim McDermott led 52 other members of Congress in signing a letter addressed to President Barack Obama, calling for him to use diplomatic pressure to resolve the blockade affecting Gaza. Gwen Moore was one of the signatories of the letter. The entire letter together with a complete list of signatories can be read by clicking here. To underscore its belief in President Obama’s health care reform, the crowd helped present Wisconsin’s two senators and eight members of the House with more than 50,000 declarations of support along the lines of Obama’s strategy, signed by residents and separated into piles, so that each representative knew how many thousands were personally marked by voters in their district. Rep. Gwen Moore (D-Wis.), the lone Wisconsin member of Congress to attend this send-off, anchored her rousing speech in the reality of what the current legislation intends and includes, not the fantasies promulgated on the Internet and cable news. She quoted a veteran organizer she admired, Bruce Colburn, who had told her of his concern that health care reform was being dismissed by the opposition as just a case of money, just one of many issues the nation must address – rescuing business, revitalizing manufacturing, returning families to savings not debt, pushing green technology and mass transit, finally passing employee free choice, education improvement, using cap and trade to fight an overheating planet. "[In Ohio] We have one of the most draconian voter suppression bills in the United States. If we are going to have a society that involves all of its citizens, we cannot allow for these kinds of bills to be passed by legislature after legislature... Across this country, 11% of all people who are eligible to vote do not have a government issued ID. That's 21 million people. Every time we take one step forward, we take two steps back. And we're not going to allow it to happen. " Rep. Bennie Thompson, Rep. Corrine Brown, Rep. Sheila Jackson Lee, Rep. Charles A. Gonzalez, Rep. Tim Ryan, Rep. Gwen Moore, Rep. Betty Sutton, Rep. Hank Johnson, Rep. Maxine Waters, Rep. Donna Christensen, Rep. Maxine Waters, Rep. Steve Cohen, Rep. Karen Bass. Rev. Jesse Jackson, Rainbow PUSH Coalition, Tamika Mallory, National Action Network, Barbara Arnwine, Lawyers' Committee for Civil Rights Under Law, Laura Murphy, American Civil Liberties Union Hilary Shelton, NAACP, Rafael Collazo, National Council of La Raza/Democracia USA, Nichole Austin-Hillery, Brennan Center for Justice, Campus Progress, Center for American Progress, Diallo Brooks, People for the American Way. Moore received $1000 in lobbying funds from Planned Parenthood in 2008. Moore has been supported by EMILY's List during her campaigning. Rep. Michael Quigley, D-Ill., said the ruling was a mainstream one, and that the Catholic Church ought to support it. 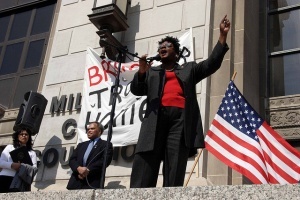 Gwen Moore has been a guest speaker at Wisconsin's annual progressive Fighting Bob Fest, in 2003, 2005, 2007, 2008, 2009, 2010. In October 2011, Congresswomen Frederica Wilson was convened two forums on Haiti - the first with Yvette Clarke, and Maxine Waters. The second with Reps. Yvette Clarke, Gwen Moore, Barbara Lee. Participants: Noemi Mendez, a leading Dominican human rights lawyer representing some of the effected individuals; Ana Maria Belique Delba, one of the few Dominicans of Haitian ethnicity who has won an appeal of the confiscation of her identity documents; and Sonia Pierre, a Robert F. Kennedy Center for Justice and Human Rights Laureate and a Dominican of Haitian-descent. Members of the Host Committee included Gwen Moore. Gwen Moore placed a tribute to her friend and mentor, socialist Dismas Becker in the Congressional Record Volume 156, Number 132 (Tuesday, September 28, 2010) [Extensions of Remarks] [Page E1753]. HON. GWEN MOORE of Wisconsin, in the house of representatives, Tuesday, September 28, 2010. Ms. MOORE of Wisconsin. Madam Speaker, I rise today in tribute to a dear friend, a mentor, a legislator, a community organizer, a loving husband and father to his family. Dismas Becker was a man of faith and that unshakeable faith remains with us even with his passing. Dismas Becker was a former activist priest who was in the forefront of the civil rights movement during the tumultuous 1960's. Along with the well-known activist Father James Groppi, Dismas participated in welfare rights demonstrations, open housing marches, and publicly defended Father Groppi's efforts to organize demonstrations in support of these causes. In October 1969, Dismas was beaten by police while occupying the chambers of the State Assembly in Madison, to protest welfare funding cutbacks. Dismas Becker's sermons were filled with anti-war sentiment and the fight for civil rights that brought complaints from some parishioners. The dissent did not sway Dismas from this calling. He later left the priesthood, but did not leave his activism behind. Dismas Becker went on to serve in other roles, including as a state representative in the Legislature and was eventually chosen as the Majority Leader in the Assembly by his fellow Democrats in 1984. Dismas Becker married an amazing woman, Fay Anderson, who was active in the local Democratic Party, and was an alderperson in her own right. He reached out to me, then a young woman with 3 children and encouraged me throughout his lifetime. In 1988, he decided to run for the State Senate. Dismas Becker suggested, pushed, and encouraged me with love to run for his Assembly seat. I am here today due in no small part to the incredible commitment of this loving and giving human being. Gwen Moore honored her friend Communist Party USA member John Gilman when he died in 2012. Ms. MOORE. Mr. Speaker, I rise to pay tribute to the life and work of John Gilman, a social justice and peace activist, author, decorated veteran and business owner. Mr. Gilman died on April 26, 2011, at the age of 90. Mr. Gilman was one of ten children born to Jewish immigrant parents in Chester, Pennsylvania. John Gilman put his beliefs into action at an early age, leading his high school classmates in a strike. They demanded a new school building due to overcrowding that caused students to attend in shifts. Mr. Gilman served as an infantryman in World War II and saw combat during the Allied advance into Germany. He was nominated for a Medal of Honor and awarded the Bronze and Silver Stars in addition to the Distinguished Service Cross for his exemplary service including ``taking out a German pillbox and tank. A social activist throughout his life, he served as Executive Director of the Wisconsin Civil Rights Congress fighting against racism. He was one of the pioneers of humanitarian aid for Cuba, worked for nuclear disarmament and was an early local protestor against the Vietnam War. Mr. Gilman marched with Father James Groppi, Father Dismas Becker, and the Rev. Lucius Walker during Milwaukee's civil rights struggle. The flooring store he operated was firebombed in retaliation for his work. The grand dragon of the Illinois Ku Klux Klan was convicted in connection with the bombing. Mr. Gilman's politics came under scrutiny in the 1950s; he was twice called before the House Un-American Activities Committee for his involvement in organizations deemed to be Communist. Gilman refused to testify or implicate anyone else pleading the 5th Amendment and displaying his military medals in a large frame to the ire of his questioners. John Gilman's autobiography, Footsoldier for Peace and Justice details an amazing life and in his own words ``standing up against what he thought was wrong. Mr. Gilman is survived by his wife Helen; daughters, Rose Corso and Jennifer Gilman; 2 sons, Herman and Glenn; a brother, Jack; and a sister, Edith Silverstein; grandchildren and great-grandchildren. Mr. Speaker, Milwaukee and the country has experienced a profound loss with the passing of John Gilman. Mr. Gilman remained active almost until his death; I am proud to have called him friend. John Gilman was a true patriot understanding the turmoil of war firsthand through his honorable defense of his country but still fighting for peace because of his service. Today, I thank him and his family for their immeasurable achievements, I mourn his loss and I salute his legacy. In 2013 Progressive Democrats of America assigned activists to deliver their material to almost every US Congressman and several Senators. Jim Carpenter, was assigned as contact for Rep. Moore. Moore is a co-chair of the Women's Caucus and a longtime friend of the Jewish community. She possesses an in-depth knowledge of the Middle East and is a strong advocate of a two-state solution. The Alliance for Retired Americans endorsed Gwen Moore in 2012. The Alliance for Retired Americans Political Action Fund endorsed Gwen Moore in 2014. You are invited to come and support our right to freely travel to Cuba and, to welcome and send off the Pastors for Peace Caravan, who are traveling to Cuba as an act of solidarity with the people of Cuba. This event is featuring U.S. Representative Gwen Moore & a video report by former members of the Supreme Courts of South Africa, India, and France on the London Commission on the Cuban Five. Potluck & Program start at 6 p.m, Sunday July 13th 2014?at the Central Methodists Church on 639 N. 25th St., Milwaukee, with a Potluck dinner, followed by a presentation on U.S.-Cuban relations by Rep. Moore. November 29 2018, Congresswoman Gwen Moore announced her endorsement of Bob Peterson for the citywide seat on the Milwaukee Public Schools Board of Directors. Congresswoman Moore is the most recent addition to a growing list of public officials and community and educational leaders voicing support for Peterson’s candidacy.